Folks have been visiting California Cavern (folks such as Mark Twain and John Muir) for over one hundred fifty years, spelunking the caves below the Sierra Foothills and marveling at the cavern’s crystalline formations. It’s quite a piece of history in the Foothills, really, as it’s the very first show cave in the state of California. Around 1850, Captain Joseph Taylor discovered the cavern during a session of target practice. As he took aim at targets, he noticed they were being blown by an unseen wind. Upon further investigation, Taylor uncovered the entrance to a cavern — California Cavern (though he originally named the cave system Mammoth Cave). Later that year, the caves were open for business, and have been ever since. 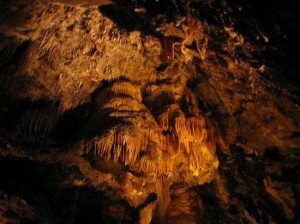 There are four tours offered — two walking tours and two spelunking tours — each of which offers an incredible and unique look at what lies below the Sierra Foothills. The unique, delicate beauty of the cavern’s crystalline formations are on display, such as the rare beaded helictites found in the “Middle Earth” area of the cavern and the fantastic array of stalactites in the “Jungle Room”. The thirteen-mile trip from Murphys to the cavern is nearly as breathtaking as the cavern tours themselves. Take Sheep Ranch Road north a ways; you’ll wind through the Foothills and catch an exquisite glimpse of the beauty of the area. Look for Fricot City Road, make a left, enjoy the scenery for a few more miles, then take a right on Cave City Road. Voila! California Cavern!